Imaging is the traditional modality for staging of most cancers. However, skin cancers in particular do not lend themselves to imaging as a form of staging in many cases, even more advanced skin cancers. Invasive cancers can be well assessed with visual examination and digital palpation for depth and extent. Imaging may still be required for evaluation of lymph node metastases. Evaluation of local extent of skin cancers can be done with CT scans, MRI scans, and ultrasound. However, often all that these modalities show is what the clinician already knows. Imaging confirms tissue density changes due to cancer invasion that is easily palpable. Furthermore, CT and MRI is not even as sensitive as digital palpation for cutaneous induration and thickening by cancers. Therefore, CT and MRIs are used primarily for evaluation of deeper structures that are nonpalpable. CT and MRI could be used to delineate the extent of a deeply invasive cancer and its relation to the large blood vessels such as jugular vein and carotid artery. Common areas of head and neck that require evaluation for local extent of the cancer include the orbit and the infratemporal fossa. Both are best evaluated with an MRI. 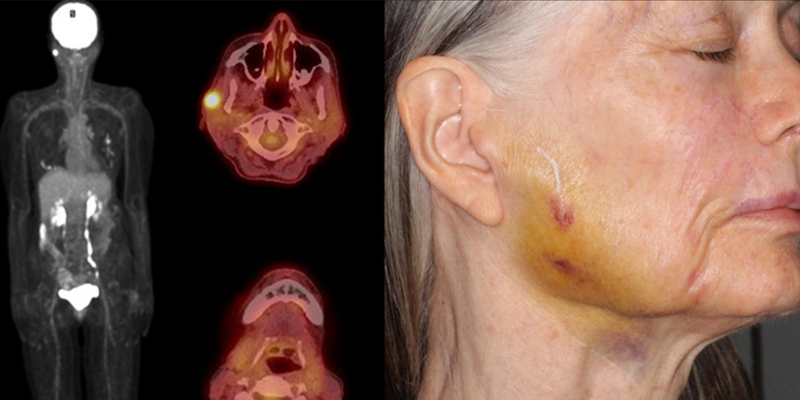 Evaluation of a deep tumor spread behind the mandible within the parotid is also useful with an MRI. This may determine that the cancer is spreading much deeper in the parotid gland and facial nerve may be at risk. CT scan with contrast can visualize almost everything that MRI can, but with less resolution. CT scan excels at evaluating relationship of soft tissue tumors to bone. It can determine if there is bone erosion. MRIs are uniquely capable of evaluating tumor spread within fatty tissues. Fatty tissues have unique signal on the MRI (high on T1). Evaluation of the regional metastasis such as lymph node metastasis of tumors often requires imaging. Both CT and MRI are adequately useful in this. An underutilized modality is ultrasound. Despite its low cost, it has been shown to be just as accurate in detecting cervical lymph node metastasis as CT and MRI at a much lower expense and without the need for IV contrast. CT/PET scan is a unique modality for determining location of cancers anywhere in the body. The PET scan component is able to find hypermetabolic foci that could be diagnostic for cancer metastasis. The limitation is the 4 mm diameter size of the lesion necessary to provide high enough signal for detection. Therefore, micrometastases are nondetectable with a CT/PET scan. CT/PET scan can detect small lymphatic metastases with greater accuracies than CT or MRI alone.